Recently I saw a film of Leoš Janáček’s opera, Katia Kabanova. It was a production by the Teatro Real in Madrid, directed by Robert Carsen. The opera is based upon a nineteenth century Russian play, The Storm, by Alexander Ostrovsky. The theme of the work is the destructive effect of middle class moralism on people’s lives. This has renewed relevance for our time, thanks to the Tea Party. The opera takes place in a Russian village on the Volga River. Katia (Karita Mattila) is married to a merchant, Tichon, whose widowed mother, Marfa, is constantly lecturing him about how he must assert his authority over his wife, or she will be unfaithful to him. (This is not far-fetched. From Phyllis Schlafly to Michele Bachmann, the fiercest advocates of patriarchy have been women.) Katia, however, has caught the eye of Boris, who is constantly being berated by his uncle, Dikoj, who controls his inheritance. When Tichon goes away on a trip, Varvara, a foster daughter of Tichon’s family who is sympathetic to Katia, persuades her to secretly meet with Boris. Katia does so several times, and she and Boris make love. Not surprisingly, Marfa turns out to be a hypocrite (isn’t that always the way? ), for she is having a torrid affair with Dikoj at the same time. When Tichon returns, Katia is seized with guilt, and she confesses her infidelity before the entire village. Dikoj orders Boris to leave for Siberia. Overcome with grief, Katia drowns herself in the Volga. Carsen has the stage covered with water. An important motif in the opera is the dual nature of water, which can bring both life and death. 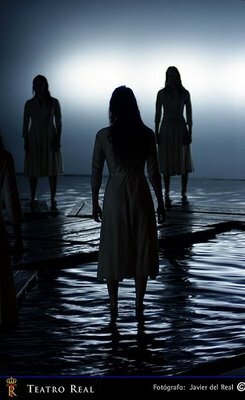 The actors stand and walk on narrow wooden platforms, which are moved around by women dancers wearing white dresses. The narrowness of these structures represents the constricted nature of the character’s lives. Janáček’s music is agitated and sometimes harsh, reflecting the inner turmoil of the characters. Yet there are passages of soaring lyricism, which not only reflect the fleeting moments of happiness in these people’s lives, but also hint at the possibility of a better way of life. I highly recommend seeing this film if you get a chance. This entry was posted on July 21, 2011 at 7:17 am and is filed under Cinema, Music. You can follow any responses to this entry through the RSS 2.0 feed. You can leave a response, or trackback from your own site.